If a surf holiday doesn’t sound like a great time to you, then you probably need one urgently. It’s both a relaxing and thrilling getaway. You’ll likely be in a picturesque location wherever you decide to go. But we want to talk to you about the Dominican Republic for now. Why? Because it’s a fantastic spot for a surfing getaway. You do need to know how and when to go about it, however. The surf season Dominican Republic has to offer is long and beautiful, but there are some finer points to be aware of. So here’s your guide to taking a surf holiday in the Dominican Republic. Here’s something you probably didn’t know—there are actually four surf seasons in the Dominican Republic. That’s right, no matter when you come, you can be assured of catching some waves. However, that doesn’t mean there aren’t differences that might matter to you. Summer is the time when many people are thinking about making a trip. If you’ve never surfed before, this might be a good time to take your vacation. The waves are smaller and this is ideal for learning to surf. This is when things start to pick up a little. The fall surf season in the Dominican Republic offers slightly bigger waves than the summer The waves are around waist to head high, and you’ll find them to be largely consistent from day to day. In the spring, storms become less frequent. Average waves size is around waist to Chest high, ideal for people who have never surfed before or intermediate surfers that want to work on their thechnique. Big Swells still occur, but they slowly come to a halt as summer approaches. Tons of people come down to learn how to surf in the DR. A surf holiday doesn’t have to just be for those who already know how to surf. As you start thinking about when you want to head to the DR, you may be thinking about more than surfing. Since you can surf year-round, it’s important to think about other considerations. High tourist season actually coincides with the winter surf season Dominican Republic provides. That’s because winter up north is a good time for many people to escape down to the DR. If you do choose high season, remember a few things. You’ll likely pay more for flights and hotels. There are tons of great festivals and activities going on. So you’ll want to make all of your reservations as soon as you can. Everything from flights to restaurant reservations should be handled ahead of time. That way you can enjoy the beauty of the island, or the waves, in peace. From late April into the summer months, prices drop and tourism slows. It actually doesn’t get much hotter. It’s basically hot all year round, which isn’t a bad thing for most people. Keep in mind that there isn’t really a rainy season, either. It can rain at any time, but generally not for long periods of time. So there aren’t weather-related reasons that low season is so, well, low. 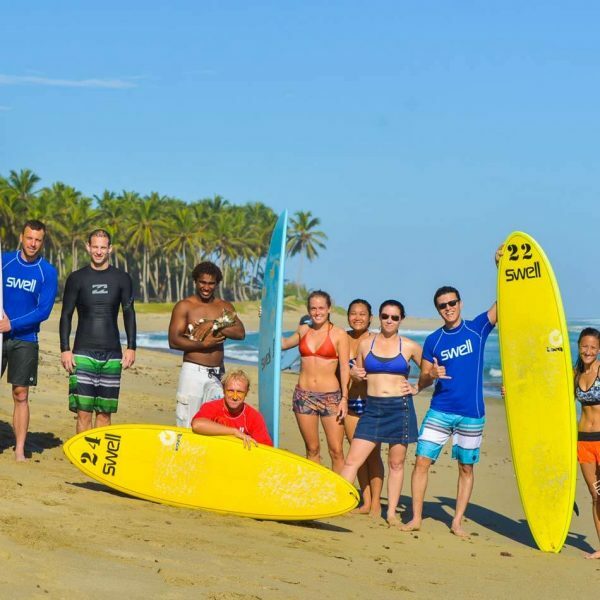 But as I mentioned earlier, the surf season Dominican Republic offers during the summer is much better for beginners. For experts, it simply won’t be as challenging. Here are a few things to think about when considering coming during low season. It will be less crowded and more low-key. But that could mean hotels and restaurants are renovating or undergoing construction at this time. We mentioned that high season includes some great festivals. If you’re intrigued by that, then take a look at this quick list of some of the better-known festivals. Held in January in San Pedro, this festival includes rowdy drummers making their way through the streets. Huge crowds make this a can’t-miss for avid party-goers. Carnaval in Santa Domingo is the largest annual celebration in the DR. If you’re in the country during February, this is one you won’t want to miss. In fact, there’s a street party every Sunday that month. So you can catch some fun even if you aren’t there for the culminating blow-out party. Feeling glum because you’re coming during the low season? No worries! There’s still the Festival de Merengue during the last week of July and the first week of August. The music is incredible, with the world’s top meringue bands playing for two weeks. It’s the perfect way to experience the culture and music of the DR.
Have you made a decision about when you’d like to come? With the year-round surf season Dominican Republic provides, it can be a tough choice. Come in high season for big waves and lots of festivals, or low season for smaller waves and a (somewhat) quieter stay. Whatever your choice, I’d encourage you to give us a call at Swell Surf Camp. At Swell, you’ll be surrounded by people just like you who are there to surf, relax, and have a good time. There’s no need to have surfing experience. Our qualified instructors are top-notch and have taught thousands of people to surf. So what are you waiting for? Have a look at our surf accommodation, find a surf package Contact us today!